Sunday February 13 1910 I was up at work all forenoon but went to bed at 1.30 I had company in afternoon. Mary & Jennie Ott & Fannie were out. They brought us some things for the table. I was so sick Dr Smith came at 7.39 Monday February 14 1910 I put in a sick day. Hattie came out at 9.39. Rob sent me beautiful flowers for a Valentine. In the afternoon Charlie & Tishie Hedges were out. Hattie did not go home till 5.12. 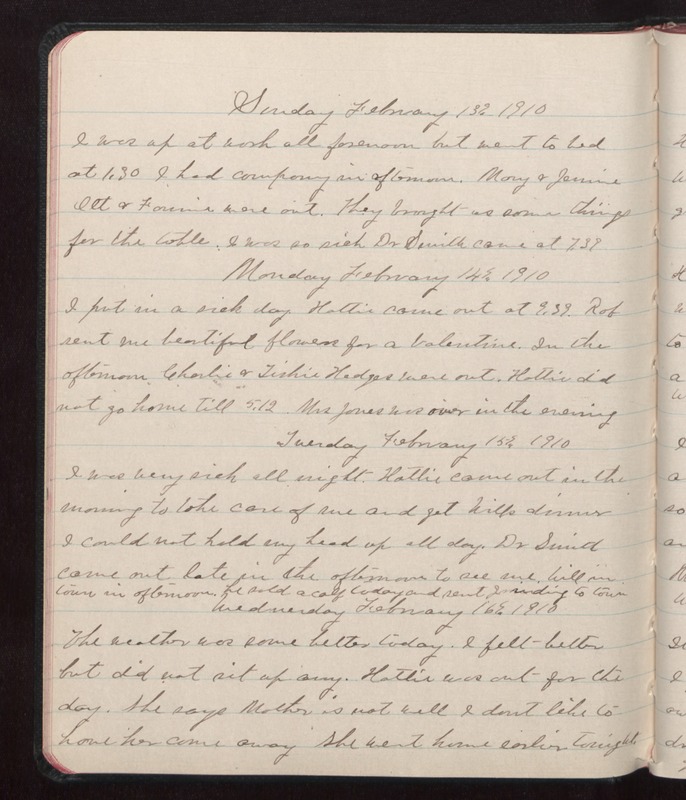 Mrs Jones was over in the evening Tuesday February 15 1910 I was very sick all night. Hattie came out in the morning to take care of me and get Wills dinner I could not hold my head up all day. Dr Smith came out late in the afternoon to see me. Will in town in afternoon. he sold a calf today and sent [illegible] to town Wednesday February 16 1910 The weather was some better today. I felt better but did not sit up any. Hattie was out for the day. She says Mother is not well I don't like to have her come away She went home earlier tonight.